Product prices and availability are accurate as of 2019-04-25 17:27:34 EDT and are subject to change. Any price and availability information displayed on http://www.amazon.com/ at the time of purchase will apply to the purchase of this product. 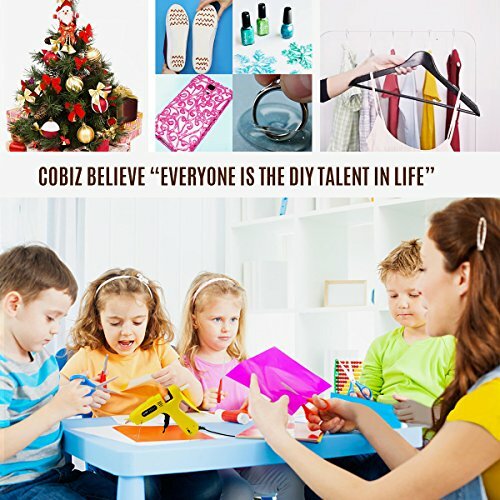 Cobiz believe "everyone is the DIY talent in life". The hot glue gun allows to show your DIY talent easily. Let your creativity flow ,order it now ! ---Unique Two Power Option * With 60W, you can get a thinner and cooler slow running hot glue stream for a fine handwork , such as placing beads . *With 100W , you can have a stronger bond for placing wooden objects together. ---Hand Free ,Hassle Free *Great controlled trigger allows the sticks move forward on its own to get your one hand free. *Stable stand allows put aside and pick it up safety anytime anywhere. ---Quickly Heat Up , Safety Use *Just preheat 1-3 minutes ,premium copper nozzle rather than aluminum give you continuous and fully melted glue. *Smart temperature control which prevents overheating to get a protection. 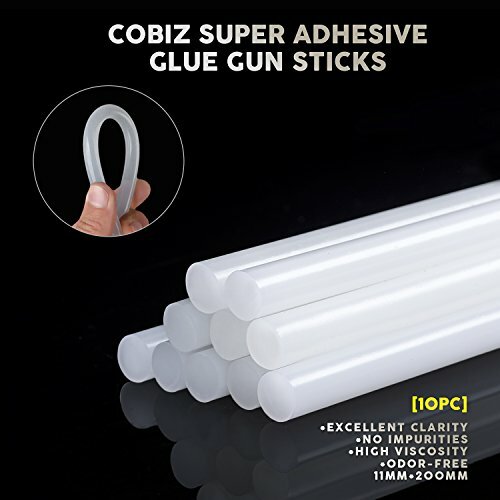 --- Optimized Glue Sticks, Perfect Work Even though only ten pieces glue sticks are provided , it gives you odorless and strong viscoelasticity performance to make your project well done. ---Trustworthy Supplier , Risk- Free Purchase *3 year warranty -A free new replacement if any quality problem. *Best after-sale customer service - 12 hours quick response ,24 hours fast process with your any worries. Contact US: Bloommics@126.com Warm Tips: 1. Keep clean of the glue sticks to avoid impurity block the nozzle. 2. The remaining pressure inside the glue gun will push a little molten glue out of the gun even stop use,please control release the trigger or cut off the power in advance to save sticks. 3.Cut off the power when stop using, and use stand to cool it down ,never put the gun flat on side while it's hot. Packing List : 1* Glue Gun 10* Glue Sticks 1* User Manual What are you waiting for ? Add it into your cart now !
? ?Great hot Glue Gun For DIY: Cobiz believe "everyone is the DIY talent in life". The Cobiz hot glue gun allows you to show your DIY talent easily. Let your creativity flow, order Cobiz glue gun now. ? 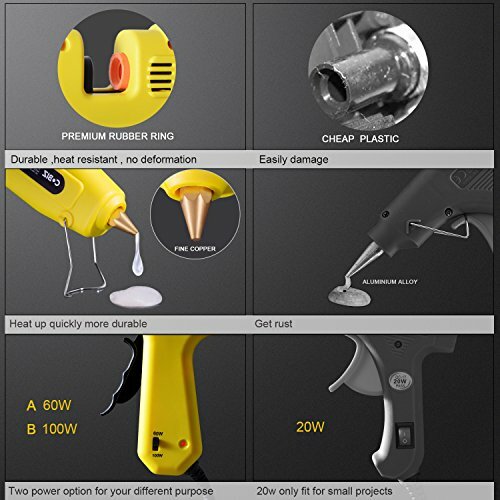 ?Rapid Heating Hot Glue Gun: It takes only 1 - 3 minutes for preheating. The hot melt glue gun has unique watt adjustment design. Not only works well for arts and crafts jobs, but also applies to home improvement and industrial works. ? 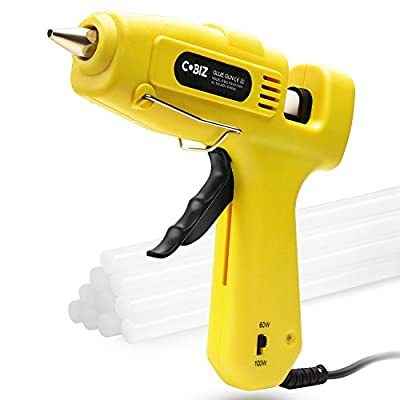 ?Excellent Design and Build Quality: Cobiz hot glue gun has an ergonomic design which makes it very easy to handle and use. It is made with high quality plastic engineered to sustain high pressure and temperature without deforming. ? ?Ten Premium Glue Sticks Included: Say a BIG NO to the sub-standard glue sticks and the unsatisfing jobs they caused. Our glue sticks are selected our most cost economical glue stick from about 20 sticks in the market which has the great performance of viscoelasticity and soundness.The glue stick is about 11mm*200mm or 7/16'' (diameter)*8" (length) ? 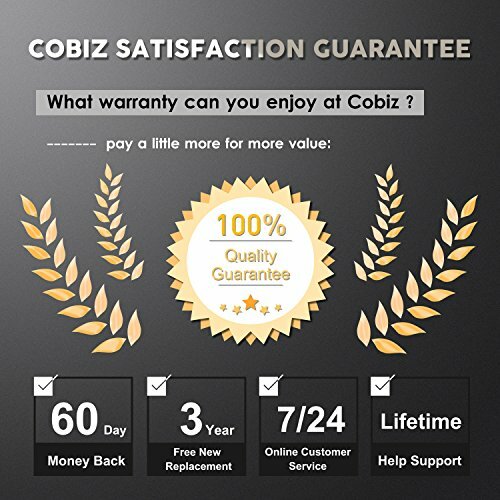 ?Safe and Efficient: Cobiz mini glue gun has inbuilt safety features that prevent overheating and a fuse to prevent leakage making it extremely safe to use. German Ceramic PTC Thermal heating system ensure quick and accurate heating.